The fifth cranial nerve is called the trigeminal and originates from the pons. The trigeminal nerve deals with motor and sensory signals. The main function of the trigeminal nerve is to receive sensation from the face and control the four muscles of mastication. The four muscles of mastication are the masseter, temporalis,medial pterygoid, and the lateral pterygoid. These four muscles create the adduction and lateral motion of the jaw. There are four main nuclei associated with the trigeminal nerve are the three sensory nuclei the principal sensory trigeminal nucleus, the spinal trigeminal nucleus, the mesencephalic trigeminal nucleus, and the motor trigeminal motor nucleus. The sensory trigeminal nucleus is responsible for the sensation of light touch for the three sensory trigeminal nuclei. The primary sensory nucleus sits laterally to the motor nucleus on both sides of the brain. 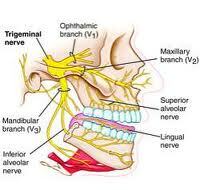 There are three major divisions of the trigeminal nerve that run along the face. The first division is the opthalmic division, also known as V1, which provides sensory information from the forehead, upper eyelid, and eye. The second division,V2, the maxillary branch provides sensory information for the lower eyelid, nostril, cheek, upper lip, and gums. 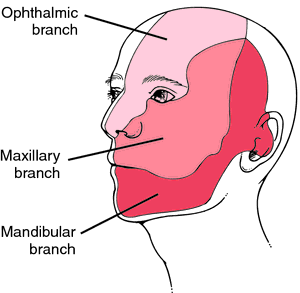 The Mandibular branch is the third division also known as V3 that provides sensation of the lower lip, gums, and jaw. 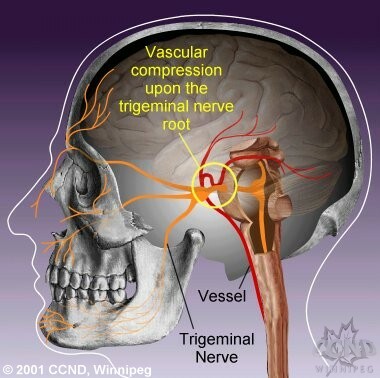 One disease affecting the trigeminal nerve is trigeminal neuralgia. A person experiencing trigeminal neuralgia may suffer an episode of facial pain that can last as long as two minutes. The cause of this disease is not currently known, but it may have to do with blood vessels putting pressure on the trigeminal nerve as it leaves the brain stem. The vessels pressure on the nerve may cause the myelin sheath to deteriorate, which would affect the nerve’s ability to generate action potentials and may lead to the facial pain. A person suffering from Type 1 trigeminal neuralgia often experiences sharp facial pain half of their day. Those affected by type 2 also experience pain half the time, but their pain is described more as a burning. This disease can have many triggers including something as benign as applying makeup or brushing your teeth. Surgery, anticonvulsants, and migraine medication are possible treatments for trigeminal neuralgia.